One of the key new features in Spotfire 7 is a smart wizard called Recommendations that's designed to guide the analytics process. Tapping built-in best practices, the tool can suggest what type of graph is best for displaying time-series data, for instance, helping non-experts stay on the right investigative path. 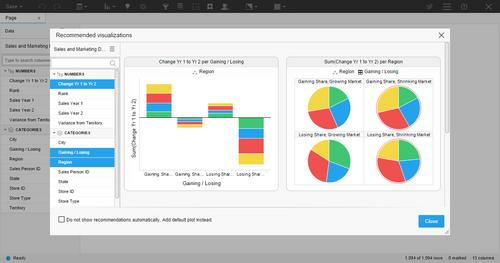 Users can create an entire dashboard with just a few clicks, Tibco says. As more data is included, Recommendations updates its suggestions, thereby eliminating the time-consuming trial-and-error process.